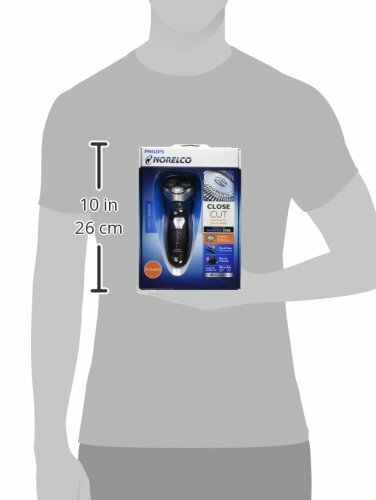 Philips Norelco Shaver 2100 (Model # 6948XL/41) gives you a closer shave even in the hard-to-reach areas at an affordable price. The CloseCut heads are precision engineered to cut up to 25% closer with durable, self-sharpening blades that won't wear down, for a shave that is always fast and clean. The Flex & Float System follows the many contours of your face, resulting for a close, clean shave. An integrated pop-up trimmer conveniently trims sideburns and moustaches. Able to be used while corded and cordless, the powerful battery delivers up to 35 minutes of shaving after an 8 hour charge. The charging indicator with LED light signals the battery charging status. Shaver 2100 is easy to clean with an integrated hair chamber and cleaning brush, and comes with a 45 day risk-free trial and a full 2-year warranty. For best results, replace shaving heads with HQ56 replacement heads every 12 months. Packaging Includes: Electric shaver, protective cap, power cord, cleaning brush.